Along with birds, hedgehogs and bugs, we also supply wildlife homes for a selection of other garden visitors to keep your outdoor space thriving with life! If you’ve been inspired to attract a variety of wildlife populations to your garden, we have the perfect range of products to give you a helping hand! Providing a safe space to support conservation efforts, and to protect animals from predators, wildlife homes can give your garden wildlife the boost it needs, acting as the perfect complement to a well-maintained and eco-friendly outdoor space. 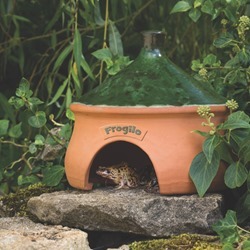 Along with our nesting boxes, and homes for small mammals, we also supply a range of frog homes, which are ideal for those who live near water, or are thinking of adding a garden pond. These are created specifically with the changing seasons in mind, providing frogs and other amphibians with shelter from the cold in winter, and a cool retreat during summer! If you have any questions about our frog homes and other wildlife products, please feel free to let us know! You can get in touch using our contact page. Frogilo The new summer and winter home!